Key West's best vegetarian restaurant pleases all. This funky cafe features some of the best vegetarian dishes in Key West. Flavorful soups, spring rolls, sandwiches, pizzas, pasta, and salads are offered, including inventive and delicious tofu recipes. The Cafe‘s veggie burgers are especially tasty and guilt free. 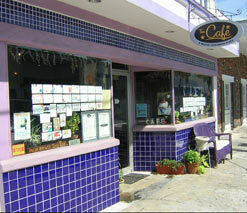 The Cafe calls itself a “mostly” vegetarian restaurant because they do serve one or two fish dishes. Hours: Open every day except Sunday, 11am-10pm.